If your kids (or someone else’s) love to travel, a great option is to buy them travel themed gifts. I love buying gifts for my kids, but I also want to spend money wisely. Travel gifts for kids meet this requirement as they provide a good mix of fun, usefulness and longevity. We have personally tried and tested many of these recommendations and hope you love them too! Whether you are looking for Christmas presents for kids, unique childrens gifts or birthday gifts for kids, we are confident you will find something on this bumper list of gifts for kids who travel. Our favorite kind of travel gifts for children are experiences. Granted, your two year old is unlikely to appreciate an experience gift as much as a new truck. But as the kids get older, experience gifts are great Christmas gifts for kids. I used to worry about an experience gift not being instantly enjoyed on Christmas morning. But the kids receive other small gifts (check out our list below!) and they don’t seem to mind the wait. I make sure to print off details of the experience, design a voucher and wrap it like any other gift. What I love the most about buying experience gifts for kids is the wonderful memories that just keep on giving long after they have been consumed. Our kids still talk about the camel ride in the desert near Jaisalmer, India we gifted for my daughter’s 10th birthday on our family gap year and the Water Park in Singapore, a cool birthday gift for the kids from their Nanna. We regularly book experiences online with Klook. They have a particularly good range of activities for Asia. In Europe, Get Your Guide have a great range of activities. In the USA, Viator is the premier choice. Check out the options on Viator here. Click here to browse experiences on Klook. For families who enjoy hiking, a small backpack is a great gift for kids who love the outdoors. My son was very pleased to receive his own small pack with hydration reservoir. We love the CamelBak range as they include a water reservoir and have kid sized packs. Click here to check the price and color options. Another active gift for kids, Salomon have a good range of trail runners for kids. Trail runners are a good compromise between hiking boots and runners for kids, especially when their feet grow so fast! Our kids have Salomon shoes and wear them both when on day hikes and when walking the city streets. The Salomon XA PRO 3D are our favorite model. They come in a large range of colors, are lightweight, have easy tie laces and there is even a waterproof model too. Click here to see the price and color range. Whenever we travel, this frisbee is packed in my son’s luggage. They are inexpensive gifts for kids that are also great for travel. Lightweight and really easy to use, it is a favorite pass time when traveling with kids. Click here to see the color options. Books are always a great gift for kids of any age. Whilst electronic readers are fantastic for kids who travel, some hard copy books are always on our travel packing list. Our 11 year old girl loved reading this book and this series by Jaclyn Moriarty recently. Our 9 year old boy carried this Lonely Planet Travel Book around the world in his backpack. It is one of the best travel books for kids, especially those kids (like mine) who love facts and statistics. Lonely Planet’s Not for Parents Travel Book – This is a really fun and educational book, with region specific titles available too. Click here to browse the options. National Geographic Kids Almanac 2019 – Facts, photos, games and stats – this is the perfect gift for kids! Lonely Planet Kids City Trails– A whole range of city books with information about the food, culture, history and interesting sights. These are wonderful books for kids who love to travel. Click here to find a City Trail Guide. Keeping a journal is a great way for kids to create their own unique memento of their travels. To make it fun, the best travel journals for kids are more than a diary. Look for journals with room to sketch, paste, color and write. These journals are great travel gift ideas for kids. Check this one by Peter Pauper – it has everything you need for kids who want to keep a journal on their trip. It has space to sketch, paste photos or tickets, and space to rate each day and is a great option for kids aged 5-10 years. This kids travel journal is good for reluctant writers who just want to record just the basic facts and highlights from the trip. For tweens and teenagers, this unique “I WAS HERE” travel journal is a great travel gift. It encourages them to explore and record the unusual discoveries they uncover on their travels. 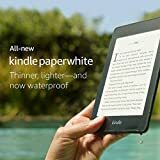 A kindleis one of the best gifts for travelling kids. Wherever you are, your kids can read their favorite book or (on the new kindles) even listen to an audiobook. Our kids each have a kindle. We also set up family sharing so they can share books across devices. They are simply the best travel gifts for kids ever and are also on our list of essential travel accessories! Click here the prices and more details. Over ear headphones are essential for kids and these bluetooth headphones by MPOW are my daughter’s favorite new thing. 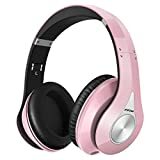 The sound quality is very good, they come in a range of colors, fold down small and are super comfy to wear. They also come with a cord, which removes the issue of recharging them or them running flat when on long car or plane trips. Perfect for on the plane and in the car, they are ideal travel presents for traveling kids. Who doesn’t love a good card game? We play cards in airports, train stations, on trains and planes, on lazy afternoons..the options are endless. Card games are good, cheap gifts for kids. SpotIt – this is an easy, compact card game that can be played by kids of any age. Click to buy here. UNO – an all time favorite travel game, this is always packed in our luggage when we travel. Check the price here. 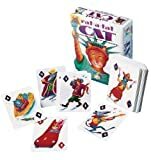 Rat a Tat Cat – an easy and fun memory game for kids to play when traveling. Click to see the game. Bananagrams – technically not a card game, but loads of fun. Similar to scrabble without the board, the aim is to build your own crossword grid in a race against your other players. Click to buy the banana! 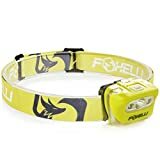 Our kids each have their own head torch and love taking them away when we travel. Early morning hikes, trips to the campground bathroom, reading under the covers at night – they have a million uses and are good gifts for people who love to travel. If you are looking for something unique, Scratch Maps are awesome gifts for kids. My son has this map and he loves scratching off each new country we visit. There are two kinds of travel backpacks for kids. Actually three. The first is the small hydration type pack like the CamelBak listed above. Small backpacks like these are great hiking gifts for kids. The second is a small day pack. These are good for longer trips with younger kids who can’t carry a lot of stuff when you travel. They are also good as carry-on luggage, or for older kids when out and about sightseeing. We love Deuter day packs and these ones are perfect for kids aged 5 and up. The third are travel backpacks for stowing all your gear when you travel. Our kids both have 30L backpacks from MacPac. They are good travel backpacks for school aged kids who can carry their clothes and small travel items. My daughter is fast outgrowing this backpack and I have my eyes on the Ace 50 by Osprey. 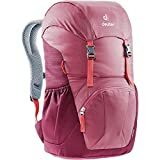 Osprey make some of the best travel backpacks for kids and we are looking forward to purchasing the next size up for our daughter (so she can carry more of her stuff!). Check the price and more reviews here. Portable bluetooth speakers are great christmas gifts for tweens. We love our Ultimate Ears UE Roll and it always travels with us. Waterproof, rechargeable and with a range of up to 20 metres, the Ultimate Ears range of portable speakers are one of the best travel presents for kids. There are a number of different styles, including the fun WONDERBOOM below, which comes in a wide range of colors for your fussy teenager. 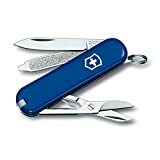 A swiss army knife is a great travel gift for teenagers. They are also surprisingly inexpensive. There are so many different styles to choose from, but a good option is the classic, as pictured below. But, if your teenager loves fishing, there is one with special tools for fishing. If your teenager loves camping, there are knives for camping. We pack an army knife whenever we travel and use it most days. ModiBodi underwear is an essential travel gift for girls who travel. We think your tween or teenage girl will secretly love you for this gift. ModiBodi underwear solves the need to source pads and tampons in foreign countries and also makes travel with your period a breeze. There is a range of styles available for girls and women plus a selection of bikini bottoms so your girls don’t miss out on swimming when traveling. If your tween daughter is anything like mine, practical travel shoes are not considered good travel gift ideas for kids! They have to look good too! We love Birkenstock sandals and think they are the best travel shoes for kids who don’t like wearing our other favorite, Keens. Birkenstock sandals are extremely comfortable, durable, come in a range of colors and styles. They have the tween girl stamp of approval. We traveled the world with our birkenstock sandals and highly recommend them as good gifts for travel. If your teenager loves taking photos or video, we think the GoPro HERO5 offers the best combination of digital image quality, flexibility and robustness. Your teenager can carry it hiking, bike riding, surfing, snorkelling and when hitting the city streets. There are newer models available, but we think the HERO5 is a good gift for kids who travel. So that is our list of gifts for kids who travel. There are many other options, so we will keep this list revised and updated as we discover more great finds. We hope you found something for your kids who love to travel and hope they love their travel gifts as much as we do! What is on your list of travel present ideas for kids? Let me know in the comments as we are ALWAYS on the look out for new ideas. What a brilliant list! I really enjoyed reading this blog post. Thank you.